So I totally didn't write an email last week because nothing cool happened that week! But in better news! I reached my sixth month mark this past Tuesday. It definitely has felt like no time since I left the small town of Willard, Mo. But at the same time it has felt like years. We had Zone Conference this week and it was super lit. We used to have them with multiple zones, but President Youngblood has changed that so now it is just individual zone conferences! It is so much better than the huge gatherings that they used to be. Also this past Sunday we had an investigator at church who is ten and so we got to go to primary with him! It was probably the best Sunday I have had in a while. 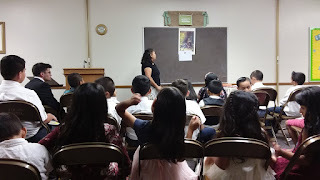 We got to sing all the primary songs in Spanish with the kids and it was so much fun! So yeah not much has been happening, but let's hope something changes soon!